Motivation Monday ~ Kristi’s Story! 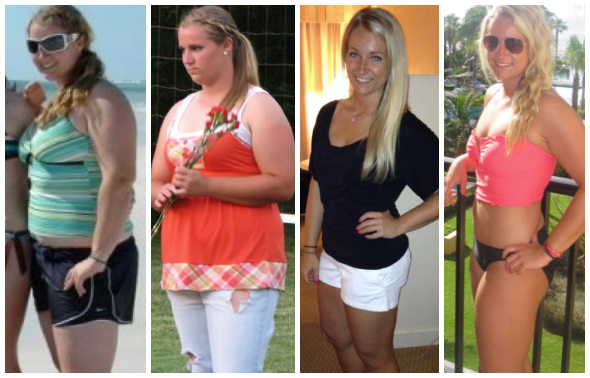 We’re so excited to share Kristi’s amazing story and transformation with all of you! This gorgeous Tone It Up team member from Northern California has an incredible outlook on how to balance a healthy lifestyle. We love her competitive spirit, passion for sports and her easy going attitude towards staying healthy. Hi Tone It Up team! My name is Kristi, I just turned 23 and I currently live in Sacramento, CA. I graduated from Villanova University, near Philadelphia, in May 2012. I was Division I student athlete, playing softball all 4 years. After graduation I moved back to my hometown and landed a job in logistics and marketing that I really enjoy. I have an amazing family, including my sister who is my best friend and biggest supporter! Your transformation is so inspiring. How long was it between your before and after pics? The first picture is in 2010 at close to my heaviest weight. Over the next 2 years I lost about 40 pounds, until I hit a plateau that lasted over a year. I was tired of counting calories and boring workouts. After I discovered Tone It Up, I broke through the plateau and lost about 15 more pounds since this year’s BIKINI SERIES. The after picture is my first time EVER confidently wearing a bikini in such a public place. I was in Cabo, Mexico this September. What made you decide to change and what was your biggest inspiration to finally make a change in your life? I had always been overweight. I was great at sports, did well in school and had awesome friends. But I was still overweight. It was the one thing that always held me back. The one thing that never came easy to me. I had little confidence in myself and was unhappy; I just kind of hit rock bottom. I told myself this is it, I can’t live like this anymore. This wasn’t the best person I could be. I was especially tired of yo-yo dieting and trying quick fixes. I knew I had to make a serious lifestyle change and stick to it. My biggest inspiration was myself. I knew I had to do this for me, not for anyone else! I set small goals, always taking things one day at a time and learning not to get too disappointed when things didn’t go as planned. One goal was to wear a bikini confidently. Check! My other goal was to finish a race. 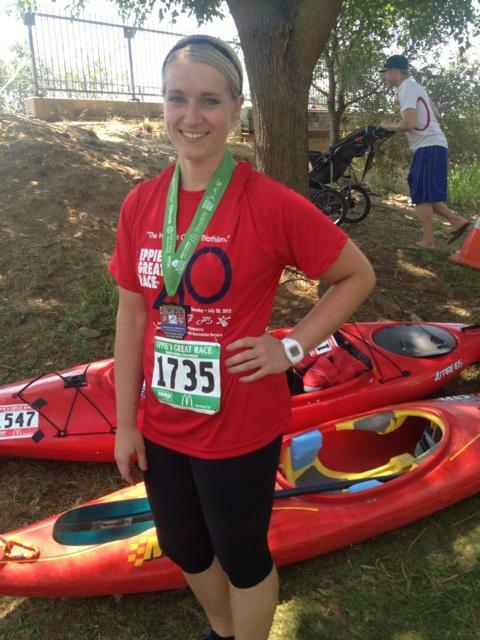 I entered in a triathlon called Eppie’s Great Race that included a 6 mile run, 13 mile bike and 6 mile kayak. And I FINISHED! I was so proud of myself; it was a great feeling. Every time I hit a rough patch I remind myself how far I have come. I look at old pictures and try to remain positive while pushing through setbacks. And if all that doesn’t work, I go shopping for workout clothes or regular new clothes in a smaller size. Did you have any setbacks along the way? If so, how did you overcome them? I had the year long plateau I mentioned earlier, which was one of the hardest times. I wanted to give up, go back to my old eating habits. But I kept going, constantly reminding myself of how unhappy I was being overweight. Then I found the Tone It Up Nutrition Plan. This supportive community has fueled me to keep going, knowing so many other people face the same obstacles I do and still succeed every day! When I found a plan that didn’t count calories or keep track of points, I did a happy dance. Seriously! I love the concept of eating clean, lean, and green, and there are SO many options, recipes, and combinations I never get bored. I never feel like I’m on a “diet.” It’s so worth it. It is easy to follow and understand and I just love getting new updates as a part of the lifetime membership! What are you doing now to keep up with your healthy lifestyle? I currently follow the Tone It Up Nutrition Plan and use many of their workouts in combination with my own. By my own I mean the ones I found on Pinterest :) I actually enjoy being at the gym at 5am! In addition, I love playing slow pitch softball, riding my bike around beautiful Sacramento, and always trying new things! What are some of your favorite healthy foods and snacks? What did you have for lunch today? Today for lunch I had leftover spaghetti squash. I add lean ground turkey, bell peppers, onions, mushrooms and top it off with some tomato sauce for an amazing meal which keeps well for the week. Food prep Sundays is something I look forward to! I also love any kind of fruit, chicken, almond butter and 97% of veggies! The Beauty & the Brussels recipe from the plan is one I make almost every week. It’s seriously amazing. Hello dark chocolate! Frozen yogurt is also a favorite. But if I am really craving something unhealthy, I find that it’s better to have a little bit of it than try and resist it all together! It’s a lifestyle, not a strict diet. I switch it up almost every day and every week. I always incorporate new workouts– from the Weekly Schedule plus others I find. Most of the time I’m at the gym very early on the weekdays and try to incorporate a few outdoor activities each week in the afternoons as well! What are your favorite Tone It Up workouts? Bikini Cardio is definitely my favorite! Not only does it make the time go by fast and spice things up on the boring treadmill, but it really has helped improve my pace on my long runs. Start by making small changes. Eating healthy and exercise makes you feel so much better than any treat or unhealthy food can temporarily make you feel. It may be difficult at first, but it will be worth it. And find a friend! It is much easier to stick with it when there is somebody to do it with you. My boyfriend and I even stay competitive with each other to keep things interesting. Tell us about your current goals? What are you looking forward to in the next few months? My current goals include losing the last 15-20 pounds and maintaining it during the holiday season! I also want to run a 10k and ultimately a half marathon by the end of next year. The team wants to connect with you!. Where can we find you? Thank you for sharing your story with us Krisi!! Way to go! Do you want to join the Tone It Up Nutrition Plan team? It’s never too late to change your life, change your body and start living the healthy, happy, energetic life you’re meant to be living! Join the Tone It Up Team Today! You already know the Tone It Up Nutrition Plan is amazing and effective – and NOW it’s even better than ever! See amazing success stories. We want YOU to be our next success story! Join the team here! !